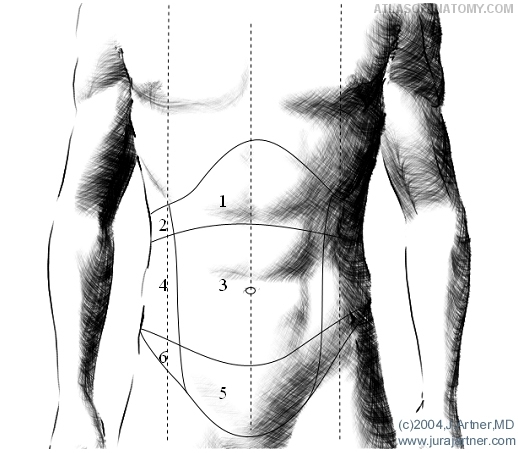 The regions of the stomach (Regiones abdominales) can be described with virtual lines: a vertical line through the middle of the Clavicula (medioclavicular line), a horizontal line halfway between the upper Sternum and the upper genital region (the horizontal layer is called Planum transpyloricum), and a horizontal line between the humps of the pelvic bone (Tuberculum iliacum) on both sides (the horizontal layer is called Planum intertuberculare). Regio epigastrica is located right under the Processus xiphoideus (at the bottom of Sternum) of the skeletal Thorax, marked by Planum transpyloricum at the bottom, and the medioclavicular lines on both sides. Regio hypochondriaca is located on both sides of Regio epigastrica, marked also by the Thorax, the medioclavicular line and Planum transpyloricum. Regio umbilicalis (the area around the belly) is marked by medioclavicular lines on both sides, by Planum transpyloricum at the top and Planum intertuberculare at the bottom. Regio lateralis is located on both sides of Regio umbilicalis, marked by Planum transpyloricum, Planum intertuberculare and medioclavicular lines on both sides. Regio pubica is located under the Regio umbilicalis, with a flowing transition into the lower located non-abdominal genital region (Regio urogenitalis). Regio inguinalis is located on both sides of Regio pubica. It is marked at the top by the Planum intertuberculare and the groin ligament (Ligamentum inguinale between the frontal upper spine of the pelvic bone= Spina iliaca anterior superior to the hump of the pubic bone= Tuberculum pubicum) at the bottom.